WorkNet, jori work, stone, katan par, Tops- net, all over work, matching. Orna- net, single par. 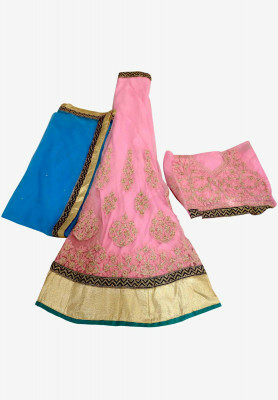 Pink colored wedding lehenga made of net fabric for women. Comes with all over Jori thread work on top. Choli, dupatta and ghagra is designed with stone, jori and net work. A very special dress for special ladies.